The Virgin Mary sits on the lap of her mother, Saint Anne. 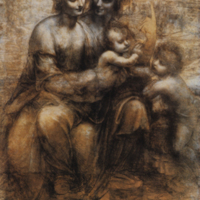 The Christ Child blesses his cousin Saint John the Baptist (the child on the right). Saint Anne’s gesture, her finger pointing to heaven, alludes to Christ’s future destiny. This large drawing is a cartoon, that is, a full-size preparatory study for a painting. 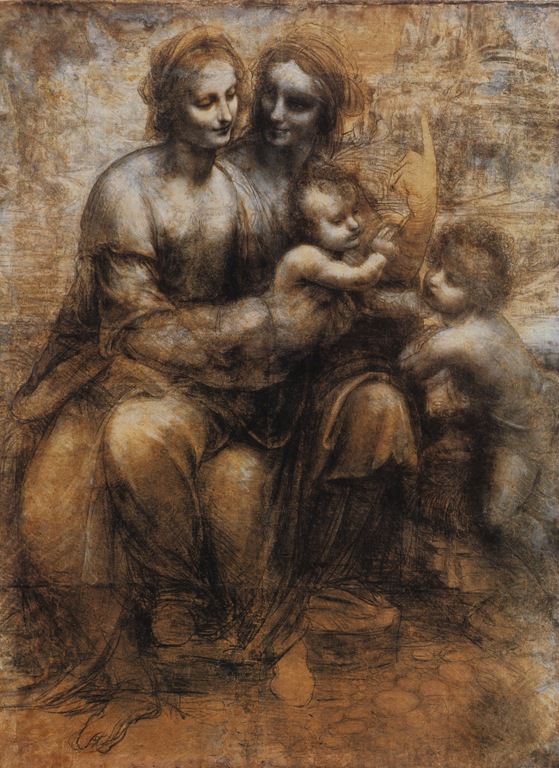 Leonardo da Vinci (Italian artist, 1452-1519), “Virgin and Child with Saint Anne and Saint John the Baptist,” Institute Images Online, accessed April 24, 2019, http://westerncivart.com/items/show/2922.